Five Canadian coaches will have an opportunity to develop their skills as apprentice national team coaches thanks to a partnership between Swimming Canada and the Canadian Swim Coaches and Teachers Association. Each apprentice coach will work as part of a team staff and have the opportunity for hands-on learning experience alongside the country’s top coaches. Each coach will also provide a report on their experience. 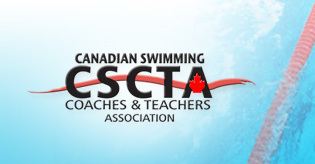 CSCTA provided funding to cover each coach’s expenses, while Swimming Canada is facilitating the national team opportunities. Renaud previously worked as Head Age Group coach in Gatineau from 2013 to 2016, where his swimmers won the Open Water Age Group national championship in 2015. He is working to develop a summer Open Water program for younger swimmers (age 12-15). Allen coaches five Para-swimmers, including Danielle Dorris, who became the youngest Paralympian in Canada’s history at the Rio 2016 Games. In addition to the overall experience of working with national team coaches and race analysis staff in an international setting, Allen is is looking to develop his expertise with other impairment classes. Tissira’s 20-plus years of experience includes coaching Brian Palaschuk to the 2016 Junior Pan Pacific Championships, now he’s looking to gain experience at the senior level. Hyslop, meanwhile, has 30 years experience including at the Sydney 2000 Paralympic Games, and leading the National Coach Certification Program in the Northwest Ontario region. She coaches 2017 FINA World Junior Championship relay gold medallist Gabe Mastromatteo, who has his sights set on the Tokyo 2020 Olympic Games and beyond. She will be joined at Junior Pan Pacs by Kozell, whose swimmers have set 18 Alberta records over the past three years. “It is great that Swimming Canada can work together with the CSCTA to offer opportunities for coaching apprenticeships across all our team programs this summer, I am sure these will be great learning experiences for coaches in Canada,” said Swimming Canada High Performance Director John Atkinson.